I've felt like it's been an age and a day since my last beauty box, so this one was much awaited for! This box is based on our New Years Resolutions. It's focus is instead of setting ourselves massive targets that we are almost 100% going to fail, to instead set ourselves smaller ones, or 'tweaks' as they have referred to them, but tweaks that by the years end, have had a big impact on our life. Looking at resolutions as tiny bitesize pieces instead of one annual huge target is a little less daunting and something that we are more liable to achieve. The first thing I noticed about this box is they have changed their internal packaging slightly. Instead of receiving the fabric drawstring bag, they were placed in baby pink tissue paper instead. Personally I find this more useful (recycling for gifts!). The drawstring bags I struggled to find a use for, and just used to keep them for the sake of it. I think I used one once, and that was for a weekend away to put dirty underwear in! I'd be intrigued to what you use yours for, so pop a comment below! I was really happy with this box due to the variety. It really has got THE perfect array of products for every part of your beauty regime - hair, body, face and health. Not to mention the cult product that has been doing its rounds for the last month or so in the blogosphere. Phillip Kingsley Moisture Balance Conditioner - I've literally just finished a Phillip Kingsley Moisture mask, and as you know, I'm not massive on hair products, so although this wasn't the most exciting product, I know my hair could do with any savior product at the moment because it's feeling horrible. The only downside to this product is its only 20ml, so it'll just cover one application and that's it (and maybe not even that due to the length of my hair!) so I won't be able to give this a proper trial run to see if I like it. Benefit PoreFessional. I love silky primers, and although I'm not excited to try this out as such (mainly because I'm actually trialing a primer at present which I think is amazing, so I've become quite comfortable with that), I do however like the concept that I have received a Benefit item in general, mainly because its nice to recognize and receive a well loved brand. Rodial GlamTox (Night). Although this specifies 'Night' on the tube, it does state it can be worn in the morning instead. It claims to smooth over complexion and plump fine lines. It retails at £75 for a full size so something must be good about it! Vasanti Detox Facial Cleanser. I'm excited to try this out because it states it is a foam cleanser, which I love. It claims to wash away toxins and 'any last traces of foundation' which I always seem to have lingering on my skin. Premae Anatomy Nutrients Instant Renewal Body Oil. I've really got into my body creams of late. Whether because I know I'm on a mission to reduce my ever-growing stash of them or not, I don't know! But either way, I've got into the habit of applying creams to my body (almost) after every bath/shower. I do have a body shop body oil in my stash that I rarely touch, and I do tend to prefer to wear oils more in the summer, maybe on my legs to give them a bit of a sheen too, because I don't like feeling too greasy, however I am looking forward to giving this a whirl. It claims to not only moisturize, but tone and detoxify the skin too. Itsu Miso Soup. All previous food samples I have been sent via Birchbox, I can honestly say I haven't liked. I have received quite a few herbal teabags before which I'm really not a fan of. This soup has intrigued me because instead of it being a powder, its a paste. It also claims to be only 42kcals, so although its good health wise, low calorie food doesn't always taste the best, c'mon, admit it! I will however fetch this to work with me to try out (tomorrow, maybe!) and give it a whirl. It states a few ingredients on it (wakame, spring onion and tofu) so so far, I'm not convinced! It's also £2.25 for 3 sachets which I think is a little pricey! 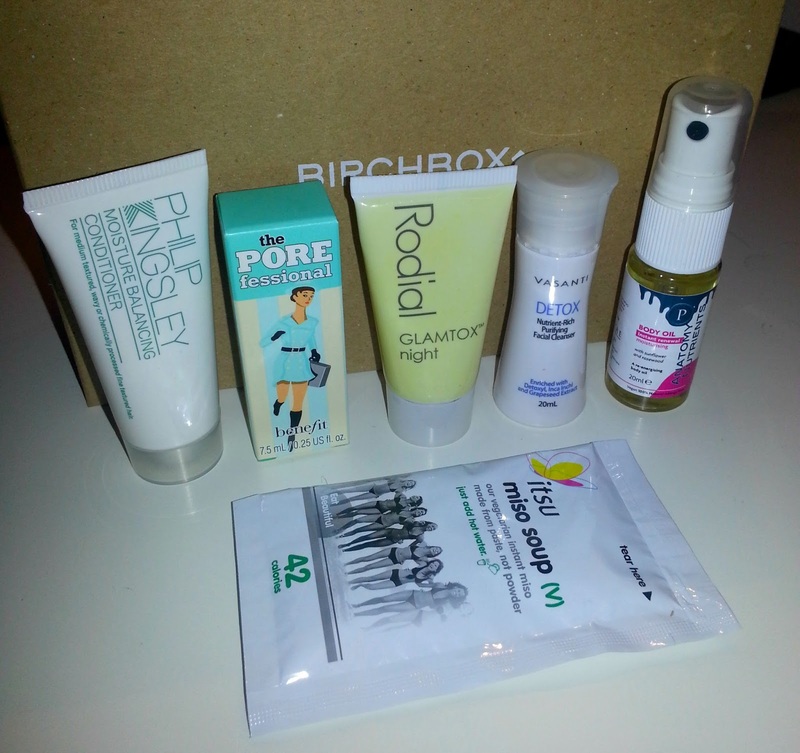 Were you impressed with this months Birchbox?